Melinda Earl, founder and CEO of StoneImpessions, is the ultimate #GirlBoss. Since 1999, Melinda has been working diligently as a female entrepreneur to pursue her dream of creating art and running her own company. Check out 10 facts below you might not know about the dynamic owner of Stone Impressions. 2. She attended University of Redlands for undergrad and then went on to the Laguna College of Art and Design for graduate school. 3. Melinda got her professional start in the art world by working at the Children’s Museum in Downtown San Diego where she worked on the children’s art programs. 4. As a single mother, Melinda turned her side garage into an art studio where she spent countless hours experimenting with different paints and chemicals. 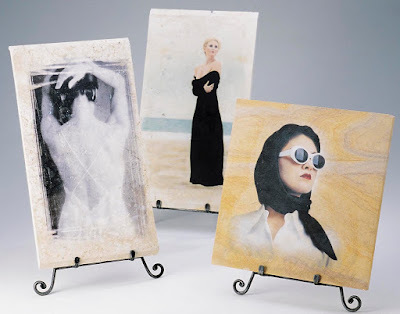 It is here that she eventually developed the patented technology that StoneImpressions uses today to print art on to stone. 5. It took 4 years and endless hours in her converted side garage to perfect her patented hand-printing process. 6. In 1999 Melinda started her first business Photostone transferring photographs, including newborns, weddings, families, and nature, onto pieces of 8x10 stone to create stunning gifts and keepsakes. 7. She expanded her business in 2001 and founded StoneImpressions. She began with only 2 employees in a converted Quonset hut in San Diego left-over from WWII, and started to create custom murals of still lifes, wine musings and landscapes using different types of stone. 8. In October 2006, she flew to New York to compete against 40 other female entrepreneurs in American Express's “Count Me In” program. She was one of the winners of the top “Make Mine A Million” award. 9. Melinda personally creates the majority of designs and images that go into the StoneImpressions’ catalogs. 10. As of 2016, she is proud to employ over 15 employees and now operates a 10,000 square foot warehouse in San Diego, CA.